for garden KIGO, see below. Japanese Gardens ... much has been written about them. 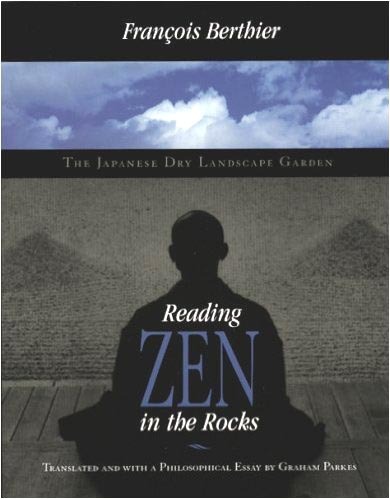 There is a difference between a Zen garden, usually in a temple, and a private garden or park, made for a Daimyo or a rich merchant. Mark Schumacher about Japanese Gardens ! Here is a short list of some articles I have produced so far. The Sakuteiki, or "Records of Garden Making,"
was written nearly 1000 years ago, making it the oldest work on Japanese gardening; in fact, the oldest book on gardening in the world! 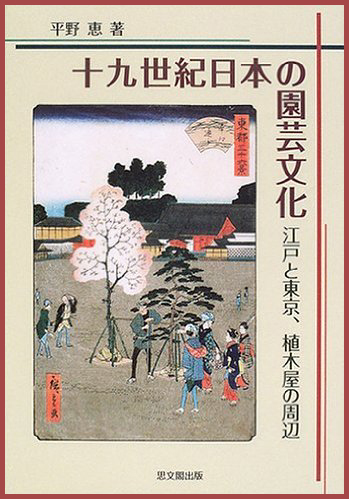 In this edition of the Sakuteiki, the authors provide both an English-language translation of this classic work; and an introduction to the cultural and historical context that led to the development of Japanese gardening. "The Beauty of the Japanese Garden"
The Japanese garden evolved from the landscaping of gardens and it developed into an original art form to become an important part of the Japanese culture. The art of Japanese garden is closely associated with the art of architecture and the stone arrangement which are the integral part of the comprehensive art of gardens. History of the Japanese garden goes back to around 7th century and the early documents about the design of gardens are from approximately the 10th century. From the ancient remains of the rock arrangement ( of the AD 5th century ) we seem to find some likely resemblance in the existing Japanese gardens. They are the circular layout of rocks either flat or upright found in Akita and Hokkaido. However, it appears that they were used for the spiritual rituals and not designed for as stone arrangement for the beauty of gardens. It may be fair to say that the concept of gardens were yet premature in this period. Although these early circular stones or other rocks that are jutting out in the cliff were the objects of worship and prayer for the spirits of nature, such spiritual foundation for the stones continued to sublimate in the later art form of stone arrangement and gardens. In the transition process from 7th century to 10th century, Buddhism and new cultures were brought in from China and Korea and they played important roles in the development of garden art. 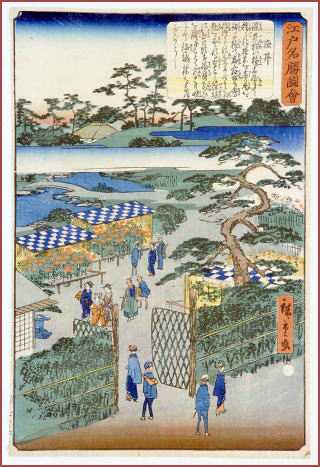 They became the philosophical foundation for the original design of the Japanese art of space in the form of gardens. In the background of the design and rock arrangements of the Japanese garden there is a respect for the nature and abstract representations of the utopian world of the time which were derived from the religion and philosophy. 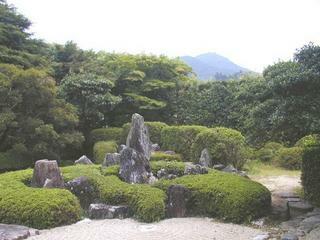 Therefore, the Japanese gardens use natural stones, only without any artificial processing. They are arranged to show many expressions of sometimes dynamic forms and other times extremely subtle and sensitive forms. These gardens give many impressions to those who appreciate them and they move people in various ways. This is the evidence that the designers of the Japanese gardens of different times had extremely sophisticated sense of beauty and aestheticity. In the following section we will see the Japanese gardens from different historical period and appreciate their beauty and the designs of arrangements. ©　"The Basics of the Japanese Garden Elements"
The web site is dedicated to the gardens of Japan, and primarily to the historic gardens of Kyoto and its environs, including Nara.
. Edo craftsmen　江戸の職人 Edo no shokunin . There were various types of specialist in Edo. Uekiya and niwashi are terms for professional gardeners; the former was coined in the Edo period and the latter in the Meiji period. 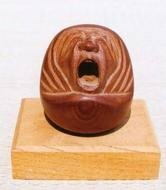 "The origin of the term niwashi has not been pinned down very accurately. . . . "
"Edo saw the rise of the niwashi or the professional garden maker who would eventually replace the role of the traditional designers . . . "
Dates of birth and death unknown. A gardener (niwashi) from the Azuchi-Momoyama to the beginning of the Edo periods (late sixteenth to early seventeenth centuries). He was involved in building the garden at Sanpōin of Daigoji temple, under the supervision of head priest Gien Jugō.
. hana-uri, hana uri 花うり / 花売り flower vendor . the Somei area -- a general name given to a cluster of small towns and villages that specialize in growing ornamental plants and trees to plant in the gardens of all the wealthy daimyo in Edo. The two main towns in this area are Komagome and Sugamo, but most people in Edo know the area as "Somei" and the farmers who live in the region are known as the Somei uekiya (the landscape gardeners of Somei). They get their reputation from their great skill in raising thousands of different types of ornamental plants. The farms in the Somei area produce most of the ornamental plants that the daimyo plant in their gardens, and many flower markets are held in the small towns along the Nakasendo, where common people can also buy flowers, trees and shrubs. In fact, even the beautiful gardens inside Edo Castle are landscaped and tended by gardeners from Somei. 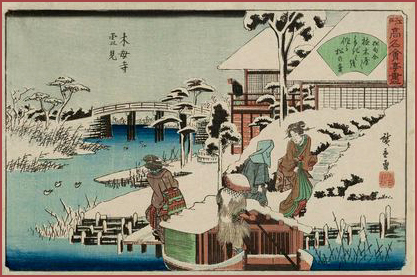 Gardening is one of the most common and most universal hobbies in Edo. 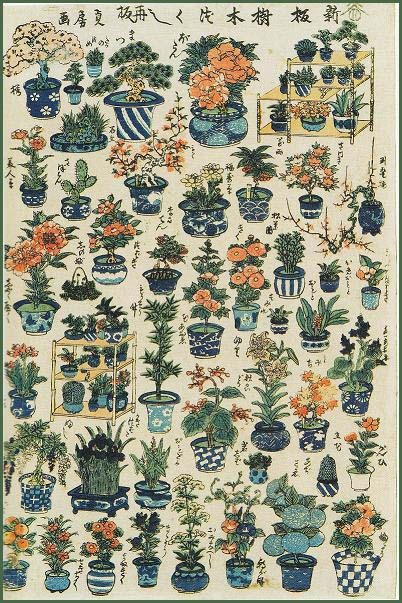 Although the daimyo spend lots of money to build large and extensive gardens, even the poorest city dweller can raise flowers and small shrubs along the roadside or on their balcony, because all it takes is a pot, some dirt and a few seeds or cuttings. Since poor city dwellers have only a limited amount of land for growing plants, one popular hobby of lower-class people is bonsai . A bonsai tree is planted in a small pot and carefully trimmed to keep it from growing too big. If the grower does a good job of tending the tree, in ten years or so he will have a miniature bonsai tree, that looks exactly like a full-sized tree, but is only about a foot tall! Although Edo is a very crowded city, it is quite beautiful. In even the most crowded downtown neighborhoods, you can always see beautiful and well-tended flowers, shrubs and bonsai trees in almost everyone's front yard or doorstep. However, nothing can quite compare to the sight of Somei, with its endless acres of bushes, flowers and trees of every type imaginable. Somei is the home of one of the most famous gardeners in Edo: Ihei Masatake. Masatake is the son of perhaps the greatest landscape gardener ever -- Ihei Sannojo, and many believe that Masatake is as good at actual gardening as his famous father. The Ihei family first got into the landscaping business back in the early days after Edo was founded. Masatake's grandfather was a simple farmer in the northern suburbs of Edo. Back then, most of the farms in the area grew only rice and vegetables for sale in the city, though a lot of farmers supplemented their income by working part time as gardeners and handymen at the estates of daimyo who lived nearby. Ihei Masatake's grandfather was named Hotsukimaru. Since he was just a poor farmer, he did not have a last name. In Edo, most of the low-class people do not have a surname, because surnames are a sign of respect, and only fairly important people are allowed to have one. Hotsukimaru got a job working as a gardener and handyman at the estate of the Todo family, who were the rulers of Tsu province, in southern Japan. When Hotsukimaru was still a young man one member of the family, Todo Ihei, brought back some azalea bushes from his home in Tsu province and asked Hotsukimaru to plant them in the garden. The azaleas from southern Japan were more colorful than any Hotsukimaru had ever seen before, so he took cuttings home to his farm and carefully raised the bushes around his house. He soon discovered that if he carefully bred different plants together, the colors of the flowers were slightly different. After carefully tending the azaleas for about ten years, he had bred some beautiful varieties of different azalea, including purple, red, and even white varieties. After several years, when the new bushes had grown big enough, he brought these new varieties back to the Todo family estate and planted some in the gardens. When he saw them, Todo Ihei was amazed! He thought the bushes were so beautiful that he immediately appointed Hotsukimaru the head of all gardeners on the estate, and urged him to continue working to try to develop new varieties. To show how pleased he was with the new types of azaleas, Todo Ihei asked the Shogun to let Hotsukimaru use a family name. When the Shogun saw the beautiful flowers, he agreed, as long as Hotsukimaru promised to grow some azaleas to plant in the gardens at Edo Castle. Hotsukimaru felt deep gratitude for his master. Once he got a last name, he would no longer be just a poor farmer -- he would be somebody important. To show his gratitude, he asked if he could take the name Ihei as his family name (so he would be named after his master). Todo Ihei agreed, and from that day on, everyone in the area knew of the gardener Ihei Hotsukimaru. Ihei Hotsukimaru's son, Sannojo grew up on the Todo estate, and worked with his father in the gardens. More and more daimyo in the area started planting large and elaborate gardens ,so they could show off to their neighbors. As the demand for gardeners increased, Hotsukimaru and Sannojo set up a family landscaping business. Although many other farmers in the area also began doing landscape work at the daimyos' estates, the Ihei family was the most famous. All the daimyo wanted to have their landscaping done by the Ihei ueki-ya (the Ihei landcaping company). Sannojo learned all about azaleas from his father, but he could see that there was a strong demand for all sorts of flowering trees and bushes. He started to study every type of flowering tree and bush he could find, and planted many different varieties on his farm in Komagome. 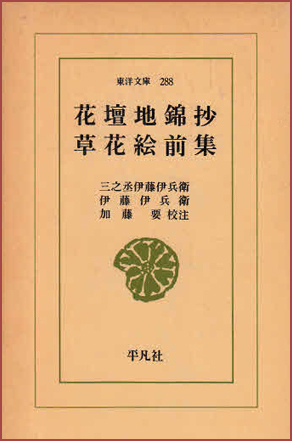 By the time Sannojo was thirty, he had developed several new varieties of ume (plum trees) and sakura (cherry trees). Since the new types were more colorful and had more flowers, all the daimyo wanted to buy them for their gardens, so they could show off to their friends. Sannojo became very wealthy selling the new types of cherry trees, plum trees, azaleas and other flowering bushes. When they saw how succesful the Ihei family had become, most of the other farmers in the area stopped growing rice and began raising ornamental plants instead. By the time Masatake was born, Somei was the center of a huge landscaping business. From the time he was a little boy, every hour of the day he spent doing landscape work for rich daimyos, or trying to breed new varieties of flowers. The demand for trees and shrubs to plant in the elaborate gardens of Edo provides work for hundreds of farmers, and the convenient location of the Somei area -- on the main road leading into the suburbs where all the daimyo live -- makes it the "flower and garden center" of the entire country. Naturally, every daimyo wants to have the most unique plants in their garden, so they can show off to the other daimyo . 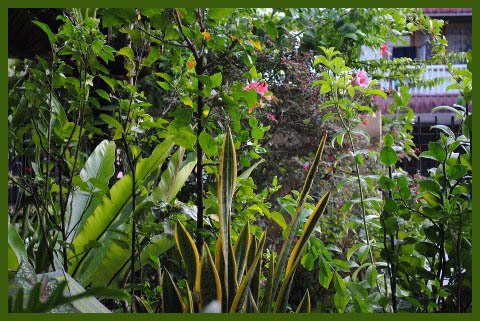 Therefore, the Somei uekiya (landscape gardeners of Somei) search far and wide for new varieties of plants. Not only do they try to breed new varieties of popular flowers; they also search in the forests for new species that might make good ornamental plants. They even import seeds and cuttings from countries far, far away. In 1695, Ihei Sannojo published a best-selling book on gardening that gave information on over 2000 different types of plants, including varieties from as far away as Africa and South America.
. Kobayashi Issa 小林一茶 in Edo . .
..... eda orosu 枝下す（えだおろす）"take away branches"
In summer when the trees start to grow and bring too much darkness to the garden or grow over roofs and windows, they have to cut back. Thus the inside will get more light and the garden feel cooler.
. niwa no tategoto 庭の立琴 koto standing in the garden . The following postings are a transcript of students' responses to our unit on Art and the Ordered Cosmos: Japanese views of nature. Before completing this assignment, students examined Zen Buddhism and its notion of the transience of the world, Shinto, and their expression in the samurai code of Bushido, "The Peach Orchard" from Dreams by Akira Kurosawa which exemplifies the Shinto notion of nature as alive and as an expression of the Kami while also demonstrating the Zen notion of the transience of beauty and the world, and the Japanese Way of Tea (tea ceremony). Students also studied Zen gardens and created one in class. Students were required to write a Haiku poem, an art form which attempts to capture some essential aspect of eternity through a single moment in nature. Student postings have not been edited in any way. surrounded by friends and light. "Rikugien is one of Tokyo's most beautiful, Japanese style landscape gardens. Built around 1700 by Yanagisawa Yoshiyasu, Rikugien literally means "six poems garden" and reproduces in miniature 88 scenes from famous poems." buzz ! skreez ! 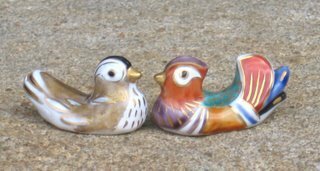 chirps !
. Gabi Greve, Summer 2012 . INCOMPARABLE JAPANESE GARDENS, photographs by Gorazd Vilhar, text by Charlotte Anderson. Tokyo: IBC Publishing, 2008, 192 pp., with 159 full-color plates, ¥5,500 (cloth) If we compare the "incomparable," we will discover that the difference of the Japanese garden depends upon the Japanese, very different, attitude toward nature. Two attitudes toward nature are everywhere possible: you confront it or you accept it. This is illustrated in gardens West and East. In the former (think Versailles), nature is but the rawest of materials to do with as you will. Trees are in ordered ranks, paths are straightened, a form is imposed. In the latter (see any of the 75 Japanese gardens here beautifully photographed), nature is accepted and adopted as a model. 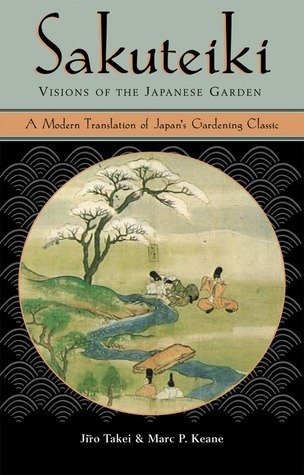 But as Charlotte Anderson tells us in her interesting introduction, one of the earliest garden manuals, the 11th-century "Sakuteki," recommends "looking at nature's most beautiful landscapes for inspiration, yet it advises that a garden should reflect nature, not copy it." Nature is thus not only accepted, it is also naturalized. Just as the flowers in ikebana ("living flowers") are presumed to be more flowerlike than any natural bloom (even though those seen in ikebana are, having been picked, either dead or dying), so the Japanese garden is to be more natural than nature. To achieve this desired effect, gardening in Japan reached the unexampled heights that Gorazd Vilhar's photographs well illustrate. At Kyoto's Shinya-in, river stones are laid in a pattern to create the impression of a flowing stream. 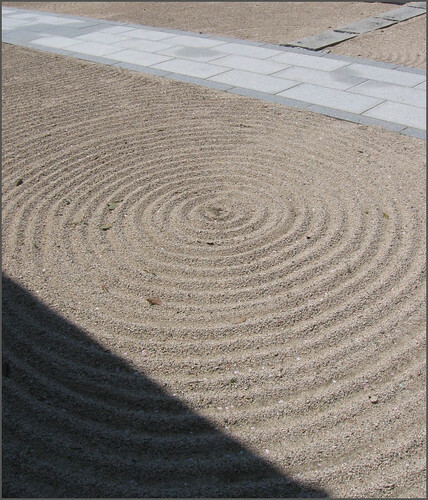 In Myoman-ji, a Buddhist monk rakes wavelike patterns in the sand of the dry landscape garden. At the Shugaku-in, the view of the distant mountains is appropriated and brought within the focus of the garden design. From here one may follow the Japanese garden as it mimics Mount Sumeru, the center of the Buddhist world, with its sand-pile reconstruction at Kennin-ji. It is then but a step to later gardens (such as the Koraku-en in Tokyo) that are so crammed with replicas of famous world sights that they seem like some ancestor of Disneyland's "It's a Small World" ride. Making the garden more natural than nature has its limitations. Anderson tells us of a man-made mountain in the Ritsurin Koen up which workmen with full buckets of water scrambled so that when the lord walked by there would be a splendid waterfall coursing down. Earlier garden design, however, kept the semblance of nature itself and it is this which is so ably caught on these pages. 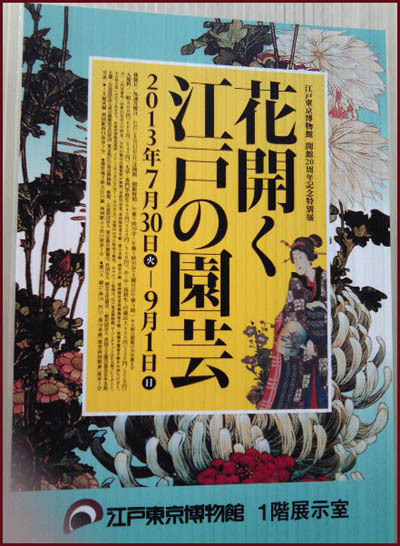 Vilhar and Anderson have an impressive repertoire of books doing this — several volumes on Kyoto, one on Tokyo, one on festivals, another on shrine and temple offerings, as well as some beautiful bound postcard collections. "Beautiful" would be perhaps the word to describe this work, in that Vilhar follows the beaux-arts tradition of creating that which is traditionally pleasing. To this he adds his own accent, one necessary to all photographers photographing here, the Japanese technique of "selective vision," finding the angle from which the power line, the parked bicycle, the vending machine, are not visible. Wide-angle Japan, showing all the clutter, is not often seen because it is not widely photographed. Rather, the view is selected, or restricted. Just as the "Sakuteki" counsels a reflection rather than a copying of nature, so, such splendid beaux-art photographs as these, reflect nature naturalized. Much has been written about Japanese gardens, with authors waxing lyrical about the craftsmanship and miniaturization that are often on display. These gardens, however, are much more than mere abstract designs; they are living landscapes that change according the season. “Zen Landscapes: Perspectives on Japanese Gardens and Ceramics” is the first in-depth Western study that looks at the relationship that exists between gardens and ceramics, suggesting new theories of representation and, above all, presenting ideas that may change the way we view such places. With lush color photos of gardens such as Ryoan-ji in Kyoto, the only real complaint is that the accompanying text is perhaps a too dense for most readers — unless you’ve got plenty of time on your hands. 巣鴨 Sugamo district "ducks nest"
Toshima ward, Sugamo sub-district 1 - 5. Komagome shichiken mura 駒込七軒村 Seven villages of Komagome.
. Somei shichiken mura 染井七軒村 .